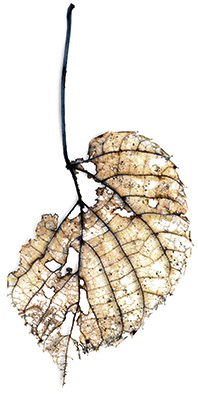 The Print Center's opening of Mike and Doug Starn's Black Pulse series of prints on of dried leaves was such a success that it was almost difficult to properly appreciate the work. As one person said, “There were so many people you couldn't stir them with a stick.” It was good to see some friend there that I missed at the garden party, and some I hadn't seen since March. I found myself responding to the inkjet prints on gampi with albumen and encaustic much more than I did to the extremely-large digital c-prints. That was mostly due to media being more suitable for the nature of the subject—the fragility of the dried leaves, of life. In part though, and maybe most importantly, it was the sheer beauty of the pieces on gampi that made them stand out against the larger, cleaner, almost-cold c-prints. The video instillation, a computer generated piece on the decomposition of leaves, was incredibly beautiful, and evoked some of the same feelings and internal imagery as Marquez's One Hundred Years of Solitude.